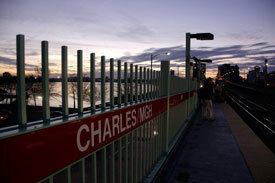 Getting from here to there across Boston Harbor is poised to get a little easier in the coming months. Wynn Resorts…hired Charlestown-based Boston Boatworks to build three ferries. The goal is to cart about 40 riders at a time to and from its Encore Boston Harbor resort casino in Everett, scheduled to open next year. A commuter ferry between the Seaport and Lovejoy Wharf North Station is expected to launch as soon as September, providing easier passage to the Seaport for commuters from the north. The Institute of Contemporary Art will soon launch a ferry from its Seaport museum to East Boston, where it’s opening a secondary campus in June. This service, however, isn’t commuter-friendly; spokeswoman Colette Randall said passengers will need either a ticket or membership with the ICA to board. 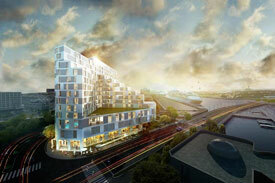 The Seaport continues to grow with office towers, residential buildings and hotels. A recent Boston Globe article notes the Seaport’s impending 14-story tower, on Summer Street in the Raymond L. Flynn Marine Industrial Park…will house both a Hampton Inn and a Homewood Suites hotel following its ribbon cutting, slated for mid-2020. The developers [are] aiming to capitalize on a growing business market in the outer Seaport, [with] travelers coming and going from Boston’s Cruiseport, and events at the nearby Boston Convention and Exhibition Center. The time it takes from here to there can be frustrating, especially if you are trying to get from the Seaport to Back Bay for a 5:30 client meeting. The distance, just 2.9-to-3.3 miles, can feel like eternity when you are in your car sitting on Congress Street heading towards the Financial District. 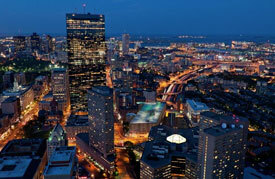 The city of Boston will no doubt entertain towers that exceed the 790-feet of 200 Clarendon Street, formerly known as the John Hancock Tower. The location of Boston’s next tallest tower will most likely fall in the Back Bay neighborhood. This is due to the restriction imposed by the FAA from the Seaport and Financial District, as well as the shadow effect on Boston Common in the Mid-Town area. According to the Boston Globe, “many Bostonians have come to love the relatively modest scale of the city’s neighborhoods. That affection surfaces every time someone proposes a building of substantial height. Invariably, issues like shadows and wind are raised. Office design has evolved to be less invasive to the environment while providing a healthier experience for its occupants. 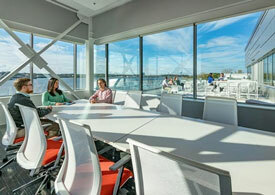 Companies are wrestling with the best balance between quiet and/or private space and collaboration space. Employees need private space, but they also need easy access to their colleagues for beneficial interactions. Individual, focused work has to be supported while simultaneously supporting group work. Everyone is trying to do more with less. Companies are actively reviewing space standards to see where they compare with the competition. Metrics of area per seat and seats per assigned staff are critical areas of focus today. Given that in many areas basic sustainability has been incorporated into building codes, there is a greater focus on wellness and health in workplace design. The office market in Back Bay is vibrant and alive with activity. It’s 18M square feet not only boasts the 1st (200 Clarendon Street) and 2nd (Prudential) tallest buildings in New England, but also will possess the tallest residential building (1 Dalton) as well. Vacancy is down and cost of occupancy has increased. Newbury Street office rents can range from upper $40’s t0 low $70’s per square foot. 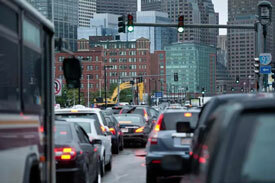 The Boston office market continues to show strong development, with 4.5 million square feet of construction underway. Rent growth and job growth have also put Boston on the leader board. A strong market dominated by its well-performing technology and life science sectors, Boston recorded a robust job and population growth—larger than Los Angeles or San Francisco. The market conditions bolstered construction activity, resulting in more than 4.5 million square feet of office space now underway. Completions stayed under the 3 million-square-foot mark in 2015 and 2016 and dropped significantly in 2017, when only 1.6 million square feet of office space were delivered. The largest office development scheduled to come online is the Akamai Global Headquarters in Cambridge, Mass. The 19-story property will bring 453,768 square feet of office space to the market and will be located at 145 Broadway, in the heart of the city’s Kendall Square neighborhood. 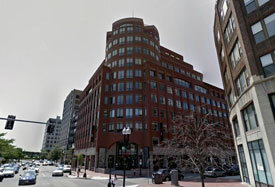 Boston Properties signed a 15-year lease with Akamai, the building’s sole tenant. The full list of the ‘Largest Office Pipelines in the Northeast’ is available, here. Amazon could be the trigger that finally connects Red to Blue for the T.
More information is available on Curbed, Boston. Two years to three months. This is that the lead time TAMI [technology, advertising, marketing and information] tenants are working with when they are in-market, looking for office space. Given this, Landlords needs to offer spec suites for immediate occupancy to accommodate the market opportunity. 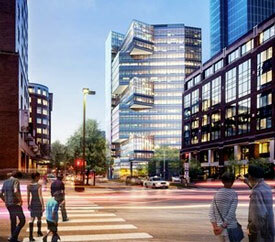 Additional information is available on Bisnow’s website, here.